Volan glassed with 2'' rail lap and maroon resin offset band. Rocker: noticable nose lift and some tail rocker. 7 1/2" x 9" base x 11 1/2'' span @ 3 1/2''. Yellow coloured pigment in fibreglass mat. Heay rovings and fin patches. Post production eg rope hole. 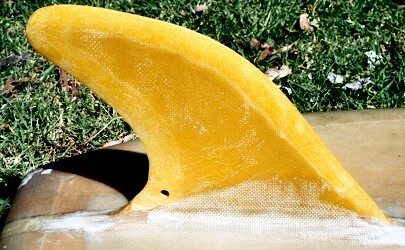 The fin has been significantly reshaped in template (to remove damaged areas) and foil. Black and yellow double arrow at rear sweet spot. - Below. Deck: 422 - pencil on balsa stringer, tail. - Left. Deck: Clear with 2'' Volan rail lap and Maroon resin offset band. Board from Woody's Collection, with thanks. Found at Nowra tip, 2004. Riding position probably on knees - note the narrow pod. CONDITION: 6, staining, minor dings.